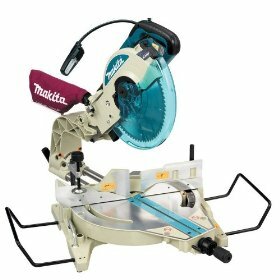 Looking to Buy 12" Makita Miter Saws? Here's What You Need to Know. 12 Inch Makita Miter Saws are known for their accuracy and stability. There are two distinct features in these saws. They come with a built in laser which allows you to make even the finest of adjustments and cut very accurately. There is an independent switch which helps you locate the laser beam easily. They have a built in high output light which is quite bright. It illuminates your work area nicely and lasts nearly 2000 hours on an average. Now, let us take a look at some other features of these Makita Miter Saws. The first thing that strikes you about these saws is that they are surprisingly easy to operate. If you are an experienced carpenter, the setup process should take you less than five minutes. These saws have 15 amp direct-drive motor which is quite powerful. The stock blade is quite sturdy and cuts very nicely. There are dual steel rails supported by ball bearings which make cutting with these saws so much easier. One of the most important things that almost every other reviewer seems to mention is that these saws are surprisingly accurate. No wobbling or shaking - the cut is smooth and precise. If you are not quite used to working with equipment that comes with in-built laser, you might find it a tad difficult to operate these saws for the first time. But you can get used to it pretty quickly. These saws come with what they call a 'soft start' feature which ensures controlled operation. They also have electronic speed control which ensures easy operation at constant speed even under considerable load. The table in these specific Makita miter saws is very stable. The pivot fence is very good and can be adjusted according to your convenience. The dust chute is quite good as well. The guard in these saws is one fine piece of engineering. It never gets in your way while you are cutting. This is a huge advantage point which makes the 12" Makita a better choice than most other saws available on the market today. One of the small drawbacks in 12 Inch Makita Miter Saws is that they are a tad too heavy to carry around. The official website says that the net weight of a 12 Inch saw is somewhere around 53 pounds. It is also quite big in size. So, you should either get a cart or just clamp it down in one place. If you move it constantly with your hands, the setup will get disturbed and you might have to reset it again and again. If you want, you can go for an MSUV (Miter Saw Utility Vehicle). It is quite sturdy and rigid. The saw fits in perfectly on this MSUV. It has got big wheels and can be moved easily as well. A number of reviews mention that it is important to clean the swiveling surfaces between the table and the body regularly to remove the dirt and dust and apply some dry lubricant. This reduces friction to a great extent and makes it easier for you to work. Overall, 12 Inch Makita miter saws seem to be a good choice for carpenters. Return From 12 Inch Makita Miter Saws Page to Home.